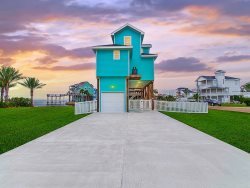 Galveston beachside house in Pirates Beach. Home is a 3 bedroom, 2 bath, sleeps 8 with beach views, just a short walk to the beach, stainless-steel appliances, beautiful granite countertops throughout, and an expansive uncovered and partially covered screened section. There are flat screen TV's in living area and ALL bedrooms. Located on quiet cul-de-sac with oversized yard and vaulted ceilings in kitchen and living areas, makes this cozy home feel bigger than it is, yet still very tranquil. Expansive uncovered balcony offers limited Gulf views, and covered screened in area offers an expansion from the kitchen to enjoy a meal with Gulf breezes in the Spring and Fall. West End's popular Pirates Beach Neighborhood is 5 miles West of the Seawall and 3.5 miles East of Jamaica Beach’s community pool. Bermuda Beach is 5 miles East of Jamaica Beach's community pool, which is located next to the City Park on the corner of Jolly Roger Road & Bob Smith Road. Pool season and hours are typically Memorial - Labor Day weekends, Tuesday - Sunday, 10 am - 8 pm (weather permitting). Admittance is $5/person (over age 6). Guests are allowed to bring in a cooler, as long as no glass or alcohol. Please see the Jamaica Beach city homepage for pool updates concerning possible extended days and hours of operation. Additional seating (8) on covered & screened balcony.